Axial load capacity is largely determined by the contact angle which corresponds to the angle of the raceway. Larger Angle = Larger Axial load capacity. The inner and outer rings of taper rollers are designed as separable making the fitting much easier. 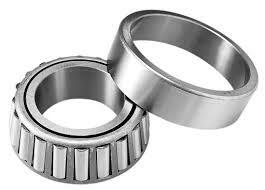 Double- or two-row tapered roller bearings feature double cups and two single cones. Double- or two-row tapered roller bearings are available in a variety of configurations for general industrial and automotive applications. Four-row tapered roller bearings combine the inherent high-load, radial/thrust capacity and direct/indirect mounting variables of tapered roller bearings into assemblies of maximum load rating in minimum space.